At the base of all modern economics lies the assumption that people always act in their own self-interest and that in doing so, they unwittingly create an economic and social order that results in “the greatest good for the greatest number.” Demand curves, reflecting as they do each person’s self-interest, add up to the total interest of society and hence to the common good. As a philosophy, this is called “utilitarianism,” and it forms the base of nearly all economic discussions. There is a certain plausibility to this, in that people would act in their self-interest, if only they had any idea of what that was. The great truth about self-interest is that it is not something known in advance; it is something discovered by experience. Who among us has not had the experience of getting exactly what we wanted, only to find it wasn’t what we wanted at all? Or of fearing the worst, only to find out that it was all for the best? “Self-interest” always remains in the future, that great unknown. Hence, it is the most useless of all economic quantities. Demand curves are not an expression of our collective self-interest, but of our collective desires. In conflating self-interest with desire, economists make a childish mistake; that is to say, a mistake which all children make. But even the most petulant child vaguely suspects that his mother might be right; that a second helping of ice cream might not be in his best interest, or that running out into the street might not be conducive to health and longevity. With time and proper parenting, a child learns to discipline his desires; this is the process of maturation, of growing up. In regard to desires, they only things we can know are what we desire and what we ought to desire. But the modern economist fears that dreaded word, ought. If this word is admitted, then the study of economics cannot be divorced from the study of values, and this (they believe) would make their discipline “unscientific.” Here they make another fundamental mistake, since economics is a humane science, and every humane science is a study of some “ought” about the human condition. Medicine presumes the “ought” of health, sociology the “ought” of civility, politics the “ought” of the common good. In abandoning the “ought” in the name of science, they abandoned the one principle that could make the discipline scientific. Without an “ought,” our desires will be disordered, and disordered desires lead to a disordered economy. If the things we desire are wasteful, we will lay waste to the planet; if greed is our goal, we create systems of oppression; if we want wealth without work, we create systems of debt leading to bankruptcy. Disordered desires are the sign of immaturity, whether for a person or a society, and utilitarianism is simply immaturity raised to the level of a philosophy. 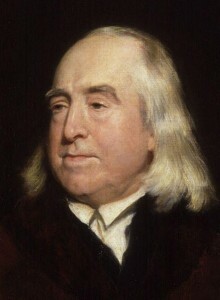 The inherent childishness of utilitarianism was acknowledged by its founder, Jeremy Bentham, when he said that “push-pin was as good as poetry,” the child’s game as good as the artist’s pursuit, and no ranking of desires is possible. But if no ranking of our desires is possible, there is no possible way to determine the “greatest” good for even one person, much less for the greatest number. And herein lies the greatest problem with utilitarianism: it is a philosophy of “usefulness” that cannot make any statement about why things are useful to us. For in truth, the only reason anything is “useful” to us is love: we buy the CD because we love the music; we buy her flowers because we love the girl; we buy lunch because we love ourselves. Utilitarianism will not go there; that is, the science of utility will not address reason that anything is useful; it therefore refuses its own question, the only question that could make the study interesting or useful. It is mere childishness, but not the joyful childishness of play and laughter and wonder, but the grim childishness of petulance and tears and whining. I knew I cut all those economics classes in college for a reason. Our macroeconomics professor’s fundamental assumption was that human beings are motivated by pleasure. Every economic decision that a person makes, is seeking the most pleasure possible. Even at the tender age of 19, I realized that the assumption was flawed and that therefore nothing built on that assumption could be true. I bought the notes for my macroeconomics class, cut all the lectures, and attended just enough lab sessions to pass the tests. The whole exercise was a big waste of time (macroeconomics was a required course, so I had to engage it somehow). Now, many years later, I see the flaw in the economist’s assumption. People aren’t moved to seek pleasure; they are, fundamentally, moved to seek love. And since love cannot be reduced to an economist’s model, the use of macroeconomics as a tool is limited. People are bigger than a model, and no model can capture the truth about human nature.